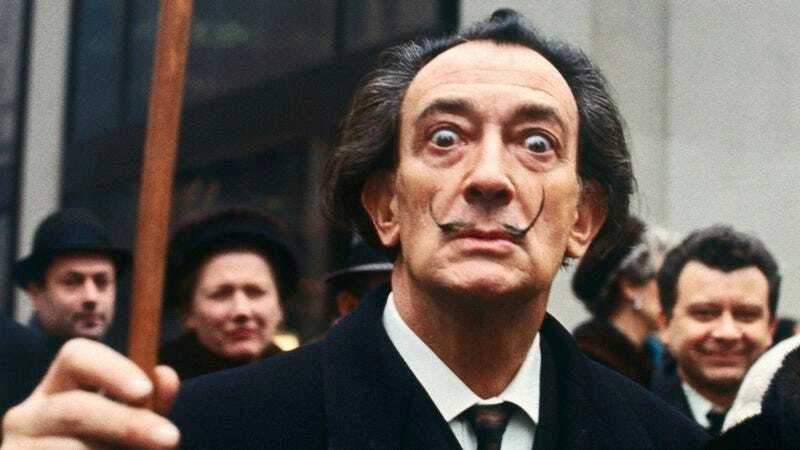 A Spanish woman who claims that surrealist master Salvador Dali was her biological father is suing The Dali Foundation, prompting the exhumation of Dali’s corpse, according to the BBC. Salvador Dali and his wife/muse/agent Gala Dali had no children in their five decades together, partially because she lived alone in a castle he bought for her for a couple decades of it. Gala had innumerable affairs during that time with her husband’s blessing, using the money she made from selling Salvador’s art to lavish gifts on her lovers. With Salvador, though, things were, let’s say, a bit more complicated. He claimed to be impotent and afraid of female genitalia, and in his later years would hold orgies which he would watch, but not participate in. Still, given his fame, genius, and ahead-of-his-time handlebar mustache, one would assume that he had no shortage of opportunities—and not just to take pictures while British art critics masturbated in his garden. Ironically enough, Maria Pilar Abel Martinez, the 61-year-old woman who says she is Dali’s daughter, is a tarot card reader, a skill she shares with Dali’s late wife. Martinez’s mother, Antonia, was a maid at a home in the Catalonian resort town of Cadaqués, next door to one of Dali’s houses; Antonia said that she and Dali had had an affair in 1955, and told her daughter—born the next year—many times that the painter was her father. “The only thing I’m missing is a mustache,” she joked to the Spanish newspaper El Mundo. Martinez first sought a paternity test in 2007, but never received the results. In 2015, she sued the Spanish state, to which Dali left his estate; if she wins, she’ll receive the right to legally request Dali’s last name and receive a share of his estate. In the absence of any (other?) heirs or personal objects from which to extract DNA, a judge recently ordered that Dali be exhumed so a biological sample could be taken. That could happen as soon as next month—if it’s not blocked by a planned appeal from the Dali Foundation.